A new introduction for 2019, Daphne x transatlantica 'Summer Ice' is set to become a favourite with gardeners. Not yet widely available, we've managed to secure some stock of this exquisite variegated gem for the new gardening season. The provocative perfume of 'Summer Ice' will pervade your garden as soon as the flowers open in spring - and plants may repeat bloom right up to the autumn! Daphnes grow into a mound of neat leaves, and 'Summer Ice' is no exception - keeping its leaves in mild winters, it's classed as semi-evergreen, providing a good backdrop of colour in your garden. Really easy to grow in rich, moist soil in sun or light shade, plants look fabulous in pots and containers too! Supplied as an established plant in a 9cm pot, ready for planting out and reaching an ultimate height and spread of 1m x 1m (3ft x 3ft). 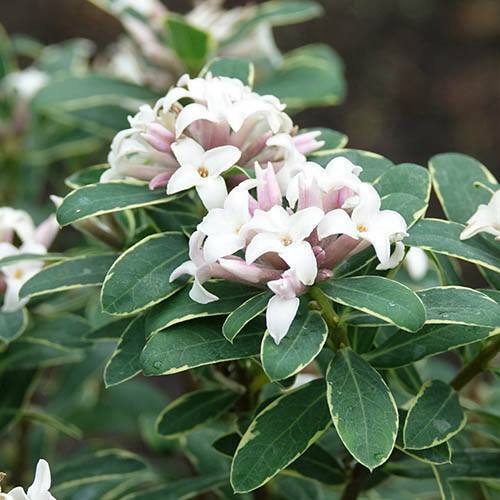 A new introduction for 2019, Daphne x transatlantica 'Summer Ice' is set to become a favourite with gardeners. Not yet widely available, we've managed to secure some stock of this exquisite variegated gem for the new gardening season. 'Summer Ice' is notable for its blue-green leaves edged with clear ivory giving it a frosted look - something rather special in Daphnes. These form a delicate crown, topped with soft pink-flushed, fragrant blooms - the plant's pièce de résistance! Be prepared to be intoxicated by the provocative perfume which will pervade your garden as soon as the flowers open in spring - and plants may repeat bloom right up to the autumn! Really easy to grow in rich, moist soil in sun or light shade, plants look fabulous too in pots and containers, and have the advantage that you can move them around your garden so that you can appreciate their fragrance wherever you are - we think that a pair either side of your front door make a unique and eye-catching (and nose-catching!) feature. Plants will thrive in sun or part-shade with well-drained soil, rich in organic matter. They don't like dry roots, so water regularly and deeply. Daphnes dislikes disturbance, so it’s worth spending a little time to decide on a permanent position before planting. Plants will establish best if planted in the spring when the soil is warm - March to Oct. Dig a hole twice the width of the root ball. Sprinkle in a handful of blood, fish and bone and work into the ground. If your soil is heavy add plenty of well-rotted compost to the area and dig it in well. Horticultural sand/grit added to the mix is also beneficial. A mulch is beneficial to keep the roots cool in hot summers.